rachel maddow | six words to change the world. 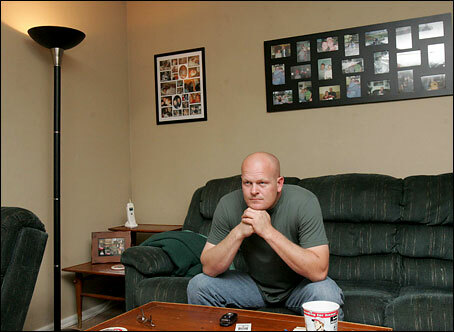 joe the plumber says he’s “horny”. “God, all this love and everything in the room – I’m horny,” declared Joe, whose real name is Samuel Wurzelbacher. And cue the chirping crickets. Rawr? When you get that special feeling, Joe, you should just go on home, slip into something more comfortable (but really, is there anything more comfortable than the JTP flannel shirt? I don’t think so! ), light some cheap smelling candles, pour yourself a fine glass of boxed wine and run a nice bubbly wubbly bubble bath for yourself. But for the love of all things holy and sacred, DO NOT tell your sexually oppressed conservative friends how you feel! I was going to go off on a HUGE multiple-paragraph tangent about the so-called liberal media but I’m going to keep this as short as possible…aka one paragraph. Guess what, folks? The liberal media smear is spin concocted to protect the Bush Administration and its followers from the press. By turning the American people against the press, the news stories– which contained the truth — were seen as biased and became irrelevant. But reporting on the horrors of war and unveiling the lies of the government is not liberal bias, it’s the job of the press. Take Rachel Maddow and Keith Olbermann out of the equation now, please, because they have equal and opposite forces named O’Reilly and Hannity. We’re talking about the journalists whose names you do not know. There is an unspoken vow among journalists to bring the truth to the people– a sort of Hippocratic Oath, if you will. Challenging and questioning a president, Congress, the government, or taking on the rest of the media? That is their function in society. If the media were so liberal, we would have had a Democratic president years ago. Trust me. I’m appalled that the liberal media excuse and tactic is still being used and people are still buying it. (McCain lost. Sarah Palin sucked. Get over it. It was their fault.) Now that Obama is president, the press will do its job to report everything that goes on. In fact, Obama seems to be losing the media fight when it comes to selling his economic plan, is he not? Not so liberal afterall…And I’m spent! And one last uber-serious thought: Has Akon ever sang about something other than sexytime?